My gosh time is just running away from me! I leave for HK next week and there's just so much to do before I go and not enough time as always. I have had weddings, engagement parties to attend and most exciting of all the boy's sister in law had a little baby girl! I spent ages cooing over the newest addition to his family =) Also had to play with his 2 and half year old niece who was becoming jealous of all the attention on her baby sister lol. Today I have for you a super quick NOTD using another holo polish by Aussie brand Glitter Gal. I was a little disappointed with the 1st one I tried here and was hoping I would have a better experience this time. So how did I go this time round? Read on to find out! I'm happy to say that I was so much more pleased this time! 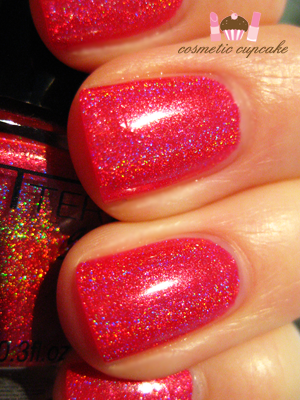 Not Another Red is a red holo with a lovely rainbow sparkle and is very pretty. It applied very smoothly and easily and the tiny brush was much more manageable 2nd time around. The polish is SUPER pigmented and 1 coat would have been enough but I wanted a deeper red so did 2 which is pictured below. All photos have no topcoat by the way. The polish dried quickly and lasted a good 2 and a bit days without topcoat and lots of wear and tear at work. It’s one of those polishes that looks different in different lighting – sometimes it’s more of a pinky red and other times its a very intense red. I find the Glitter Gal holos seem to be more a little more subtle than other brands I’ve tried but this is different to other swatches and posts I’ve seen. Maybe I got a different batch..? Anyway, it’s still a lovely polish however I just wish it was more in your face holo! 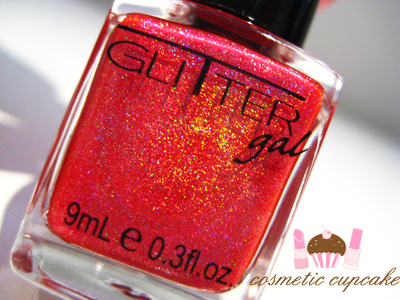 You can purchase Glitter Gal polishes from their website . woowww that a lovely colour,very nice for the holiday's i love holographic nailpolish. I prefer the Color Club ones oveer the Glitter Gals ones though. :) I've never seen a red holo. Very nice! 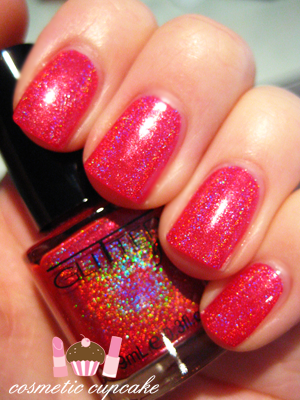 That is so pretty red holo! Love it! It's so beautiful, seems like DS ruby !! I need to give myself one of these! She is to die for <3! Now get to packing for HK =D it will come fast. I love the way it changes colours in the light, great polish!! And it withstood the wear and tear of work, BONUS points. love the color so pretty!!!! Hi Chelle! :D This is really quite lovely, I'm not a big fan of reds but I might have to make an exception for this particular red holo! Red holo goodness!!!!!! I'm in heaven!!!!! Great haul! Check out my blog for my recent review on Milani 3D Holographic Nail Lacquer! I'll also have a Sally Hansen haul up soon! Very pretty! I like how the colour changes slightly depending on the light. And the subtle holo is actually quite nice if you don't want something so in-your-face. Beautiful color!! !Thanks for the post. By the way I love your blog! It is so informative! Enter my new blog prize giveaway! Okay, this one is really pretty, and it looks fantastic on you! This is one of the better red holos I've seen. @Tsiisfamke: I absolutely love holographic polishes too, they are just so unique. I think I will use it for the holiday season, great suggestion! @London's beauty & Bee: Thanks ladies! @annkiins: It's definitely pretty! I agree - the Color Club holo polishes are in a world of their own. @Rachel Marie: I believe Glitter Gal created the 1st true red holo! @Annie: I'm glad you like it Annie! @Sarah B: I do suggest trying it out! You can order them online from their site and they ship internationally too which is great. 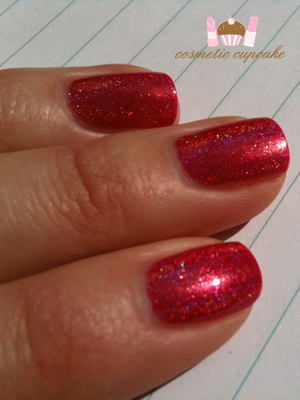 @communicatingbeauty: It's a lovely red holo, a must for anyone's collection. @Katrina: =p Glad you like it Katrina! @M: You can buy them from their online store! (see the link in the post) They ship internationally so go purchase one okies! @Mez: Definitely bonus points for holding up at work! The holo came out best in artificial light though which is the opposite of other holos though which I found a bit different. @jellytelly_ri-chan: Glad you like it hun! I love red polishes hehe. @Spaceinvaders: LOL buy one then! @Akuma Kanji: Glad you like it! @Danielle: I totally agree. I think the glitter Gal polishes are fantastic for something more work appropriate. @L.M: Thanks for your sweet comment! @Jackie S: I'll definitely be doing a review when I get home! Holos are soooooo nice hehe.